They're coming thick and fast - another review for my new book Digitized. This one is particularly fun, especially with that quote the book is an open love-letter to its subject. 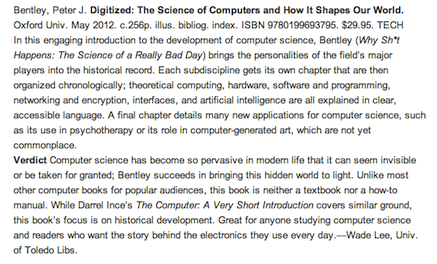 Today there's a new review for my new book Digitized, in the USA publication Reviews Library Journal. Not too bad! I'm writing to tell you how much I'm enjoying your latest book, Digitized. The most recent passage I read, about art and creativity, was wonderful. I've never come across Latham's work, but in the past I've chatted with Harold Cohen about his Aaron system (his son, Paul Cohen, was my Ph.D. advisor), and it's a fascinating area. 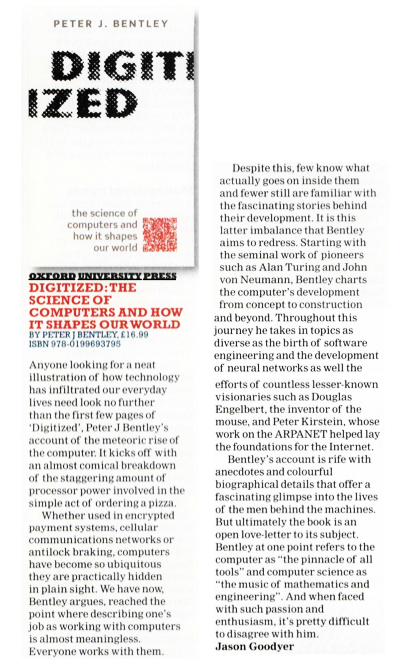 I'm also writing to mention that Oxford will be publishing another popular science book about computing in the fall, by me: Computing for Ordinary Mortals. It's very different from your book, but there's naturally some overlap in the concepts.